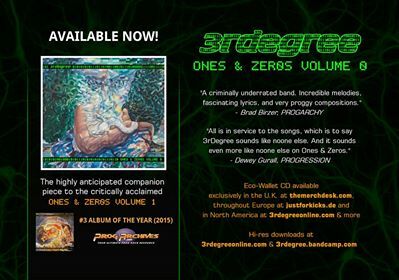 Independent American progressive rock band 3RDegree will release the follow-up to Ones & Zeros: Volume 1 on April 30, 2018. Envisioned as a prequel (that’s still a thing right? ), it is aptly titled Ones & Zeros: Volume 0. Where Volume 1 imagined a world transformed by a Technological Singularity, Volume 0 supplies the backstory nearer to present-day. companions, ambi]ous transhumanist parents, lonely internet trolls, social-media addicts trying to expand their personal brand and elites buying acres in New Zealand to ride out the apocalypse. And in true 3RDegree fashion, this is all delivered with a healthy dose of dark humor using melodic, song-based progressive rock as the vehicle. 3RDegree are coming off a high following 2015’s Ones & Zeros: vol. 1-the final release from 10T Records. backdrop and a Ted Talk-ish narrator purpor]ng to be from the fictious Valhalla Biotech Corporation which features large in Ones & Zeros. at RoSfest at the Majestic Theater in Gettysburg, Pennsylvania all day Saturday, May 5th.